Onondaga County District Attorney William Fitzpatrick is opposed to a proposal that would remove 16- and 17-year-olds out of the state’s adult criminal justice system and into family court. Onondaga County District Attorney Bill Fitzpatrick has joined other law enforcement officials across the state in recent days who are criticizing "raise the age" legislation that’s being debated in Albany. Raise the age would take 16- and 17-year-olds accused of certain crimes out of the adult justice system and into family court. Advocates say dumping teens into the adult criminal justice system makes it much harder for them to get their life back on track. But Fitzpatrick says from a public safety perspective, it’s dangerous. He says it would hamper police investigations, keep individuals off of sexual predator lists and place these youths in a system -- family court -- that isn’t designed to deal with these kinds of offenders. “They’re not little shoplifters or fare beaters, they’re gangsters, they’re murderers, they’re rapists, they're burglars, they’re violent thugs and they don’t deserve to receive a pass from the New York State Legislature," Fitzpatrick said. In a news conference last week, Onondaga County District Attorney William Fitzpatrick showed a number of social media posts in Syracuse where youth under 18 are brandishing firearms. It was part of his pitch against state legislation to move criminal cases for ages 16 and 17 into family court. 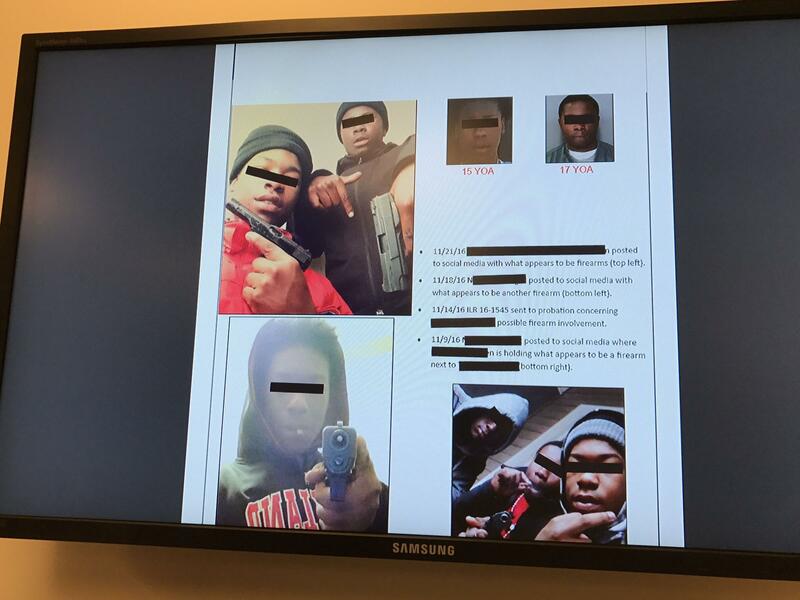 At a press conference Friday, Fitzpatrick flipped through a number of social media posts in Syracuse that show 15-, 16- and 17-year-olds all holding what look like real firearms. Fitzpatrick says prosecutors across the state are willing to talk to state officials about programs to help teens caught up in the adult criminal justice system. But for now he wants central New Yorkers to call their legislators and ask them not to support this particular Raise the Age proposal. The proposed legislation is part of the current budget negotiations Albany. Many leading legislators say, for them, the issue is personal. Those who support raising the age when New Yorkers are treated as adults in the criminal justice system from 16 to 18 held a rally Tuesday at the Capitol. Many of the leading Democrats in the Legislature spoke, including Senate Democratic Leader Andrea Stewart-Cousins. Assembly Speaker Carl Heastie is pushing for a measure to stop treating 16- and 17-year-olds as adults in the state’s criminal justice system. Heastie said the proposals would take 16- and 17-year-olds out of the adult criminal justice system and treat them as juveniles in family court. Heastie, the first African-American speaker, said this is a personal issue for him. The fight to end the practice of putting teens in solitary confinement at the Onondaga County Justice Center continues, and it’s taking place on two fronts. The New York Civil Liberties Union has filed a class-action lawsuit claiming the policy violates the Constitution, and harms young people. And groups like the Alliance of Communities Transforming Syracuse, or ACTS for short, is trying to raise awareness about the practice, with protests and discussions with county officials.